WASHINGTON, DC - (@The Comedy News) - Vice President Joe Biden has reportedly left his controvertial gun control report to the last minute. His procrastinating led to asking President Obama for an extension. With that, Biden told the President several fibs in order to get a later due date. Good news and bad news. First the good news, you da man! Hahaha just kiddin. The bad news is my printer jammed as I was printing my final draft of the gun policy task force report. So I decided to ride my skateboard over to the nearest Kinkos, but I dropped my laptop on the toilet before I could leave the house, so my hard drive is now fried! The good news is I can have the report done soon. But I'll need a later deadline. Hope that's okay. 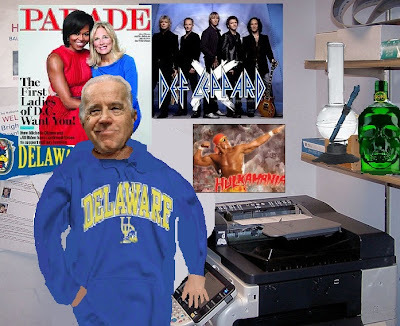 According to sources, Biden has been notorious for leaving legislation to the last minute, leading to these erratic 'print-and-sprint' behaviors. The last time Biden produced a last minute report to the President, he was seen sprinting down Connecticut Avenue in a Delaware Blue Hens sweatshirt and a borrowed pair of red Chicago Bulls basketball shorts he apparently has yet to return to the President.